Home » FUN THINGS » Category archives "Lessons & Take-aways"
I was reading Dave Seah‘s story about Ulrick the Bee, and I like this second part of the story where Tiffany appears and she ask a lot of questions! Ask early. Ask about anything that you don’t know. Because if six months have gone by and then you ask about something that should be simple and clear and easy, then you will seem to be slow and lagging behind. Then the quesiton will be, “Oh, you don’t know that yet?” Ask early. There is great simplicity to that. If you don’t know, ask. My father also told me many times, three of the most beautiful words in English are “I don’t know.” And then finding out is fascinating. Posted on 12-15-06 for Wed, 12-13-06. How to Get Out of a Bad Mood – the A.P.E. Method! Karen Reivich, co-author of The Resilience Factor, suggests some concrete steps. In a talk she gave at our Positive Psychology classes, Karen gave the best three suggestions I’ve heard for getting out of a bad mood. These are practical and immediately usable. The problem with bad moods is that they stop you in your tracks, they hinder you from doing other things that can lead to continued small successes and that can move you forward in life. Additionally, as Dave Seah points out, you can’t always be waiting for the muse. Most often in life, you need to do things whether you’re in a bad mood or a good mood. For example, compare a person who takes actions to move his life forward only when he’s in a good mood (or when the muse strikes him) to a person who takes actions to move his life forward no matter what mood may have set on him temporarily. Who will likely be more productive? Here are the three principles Karen Reivich teaches to get out of a bad mood. I remember these as A.P.E. So you want to stay focused on the task at hand, on moving your life forward. What do you do? You can generate alternative beliefs. For example, if the bad mood started with thinking, â€œI havenâ€™t done anything productive at work in the past year. I havenâ€™t contributed anything. Iâ€™ll never contribute anything. And not only do I stink at work recently, but everything else is going down the drain too.â€â€¦ then what are some alternative beliefs that you could seek? Me / Always / Everything. If your beliefs tend to focus on â€œmeâ€ â€“ â€œI did this, I got myself into a decade worth of trouble,â€ then try to look outwards a little bit â€¦ not too much â€“ do not rationalize away your own potential contribution to the situation. But do look outward if you tend to blame yourself. Do look at the environment, the surroundings, and provide other possible explanations. (Create an alternative). If your beliefs tend to focus on â€œalwaysâ€ â€“ â€œIâ€™m never good at my work, I always mess up at the office, this never goes right for me,â€ then train your brain to find the one thing that you consistently excel at during work. Feel that pride â€“ no matter how small â€“ in that one thing that you own, that is yours, and that you can reliably think about to know that you are good at that part of work. (The point is to create one alternative, so it is not always). A friend of mine Emma who is also a practitioner of Positive Psychology says that she once heard something say something so visual that she will not forget it. And thatâ€™s exactly how I see it â€“ a white porcelain tea cup on a white porcelain delicate plate, and a small steam above the teacup where the remains of the storm can be seen. It is the super-literal description of the phrase â€œstorm in a teacup,â€ and talk about perspective! Do that â€“ put some perspective on the issues. What are the probabilities that everything will go wrong? Usually not 100%. Put the perspective of time on it (probably not as intense if you were to look back on this from 50 years in the future). Put the perspective of seriousness on it (these are bad moods, but nobody should be dying from this). Put the perspective of â€œmeâ€ on this (how impenetrable does my problem look compared to starving children). The perspective of comparison is called downward social comparisonâ€¦ but in psychological studies it has proven to be effective in precluding depression. The goal in finding perspective is to create flexibility in thinking. It is not to create an excuse for things that may actually have gone wrong, but it is to minimize the impact on your life of certain thoughts. Find concrete evidence to the contrary. If you are in a bad mood because you are berating yourself, then create evidence to the contrary. If the argument is that youâ€™ve never done anything good in your work for the past decade, get a piece of paper and list two things that you have done well. Thatâ€™s it â€“ two things. Two concrete examples. E – Use concrete Evidence to discount the bad-mood self-talk in your head. Rocks & Pebbles. The father with his little daughter is on the beach with some pail, and the father shows his little girl that she can pour a lot of pebbles into the small pail, and then when she tries to add large rocks, they don’t fit…. BUT if you take those same pebbles and set them aside and if you add large rocks to the pail first, and then pour the pebbles in between the large rocks, then both the rocks and the pebbles will fit. 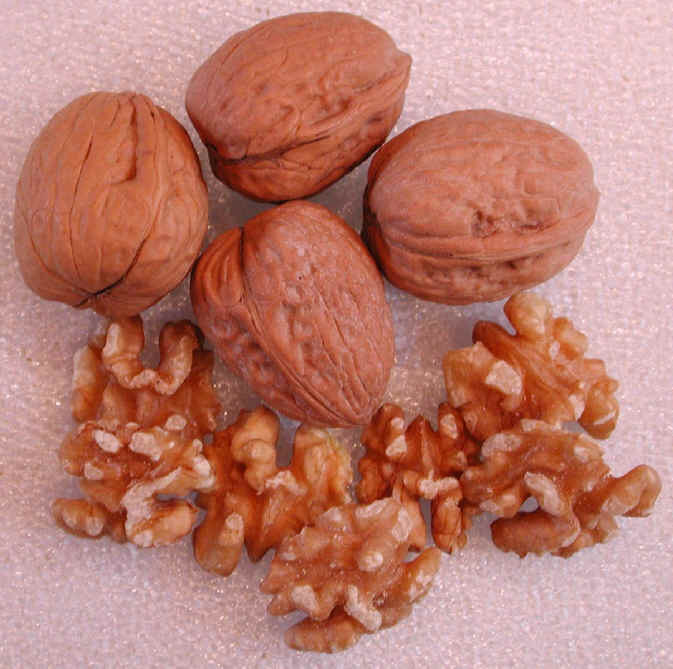 Walnuts & Rice. I always imagine this version of the story happening in the fall (around Thanksgiving or the winter school break). And I always imagine the father wandering into the kitchen while the child is playing with cooking ingredients on the kitchen table. And I always imagine a measuring cup, some unshelled walnuts on the table, and some rice in a pile. I imagine the father filling the rice to almost-full in the measuring cup, and then attemping to pour the walnuts in as well. Note: Written on 11-16 and posted for 11-15 to precede quote Thursday. Sometimes you think that because you have a thought, that it is the truth. But, often your own thoughts can fool you. How many times have you thought, “Everything is going wrong, and there’s nothing I can do,” and then you come out from that into new great things (and sometimes new bad things). Life changes. Things change. You can’t believe every thought you have – you wouldn’t believe every word that someone else says to you, so why believe every subconscious half-thought of your own head? You can use those thoughts that are productive and useful to move you forward, but if you have negative thoughts that spin in a downward spiral, then it may be that at that point, the ticker tape in your head is on automatic, and that it may be useful to switch it around. It’s funny that people respond to themselves differently than they would to their friends. I just had a unusual time where I wasn’t sure this was going right, or that was going right, etc. And it just made me so upset at myself to I know that if I were to step aside and if my friend were saying the same things… I know what I would tell her! Isn’t that so often the case – when a friend asks for advice on work, on romance, on school, on organization, on home buying, on exercise, etc., you know exactly what to suggest and recommend, but when it’s your life… so often you don’t know! Why is that? Why doesn’t your “intuition” or other advice-giving center kick in when it’s for you as much as it should when it’s for someone else? * You don’t want to make a mistake (a mistake in your life is more costly than advice for your friend’s life – because after all that was only advice; in the end, the friend makes the decision herself)? * You don’t believe the counterarguments when it’s about you? * You want to feel down and dark for a while? Those are all valid. But let’s break them down. You don’t want to make a mistake – so what?! So you make a mistake. “Do not fear mistakes, there are none,” says Miles Davis. Everything you go through can make you not go through that same thing later. Everything somehow shapes you. You don’t believe in counterarguments when it’s about you? Yes, this is an ego thing – not in a bad way! This is just a matter of – like the ticker tape beliefs – thinking that if a thought comes from you, then it maybe doesn’t need to be counterargued. That’s just not true! A million times, I will tell you that this is just not true! Your mood, your latest food, the rain, smells around you, the news that day – everything can affect you, and when you have a thought, it may just be a reaction, and something to say, “Thanks for coming, but you’re not really real.” You can have two thoughts, “this food is good for me” or “this food is bad for me.” And the funny thing is that both viewpoints may be valid. Ice cream can be bad for you, or good for you – simply because deprivation in the long run may not work for your personal body system. Broccoli can be good for you for the vitamins, or can be bad for you if farmed in some certain strange way. Everything is arguable. Including your thoughts. You may want to feel dark and down for a while? The strange, strange, strange thing is that people who go out and FORCE themselves to have a good time anyway usually make themselves feel better. This is especially true of people that have a good time, or better yet, do something FOR someone. Doing something for another person often immediately makes the first person feel better – Sonja Lyubomirsky and colleagues did a study with a control group, a group that chose one day in a week in which to do act kinds for people, and a group that did something kind everyday. The researchers asked the participants to continue this for six weeks and at the end of the six weeks, the control group had slightly decreased happiness from the start of the study, participants that had done kind things every day were much unchanged (and the researchers postulate that this is because the kind acts were not anything unusual and became habitual for that group), and participants that had done kind things on one day of each week reported significantly increased levels of happiness (i.e. well-being). And about going out and having a good time, there is a great study about bowling alone: participants that were introverts and did not want to go out bowling were taken out to go bowling with strangers, and they showed markedly increased levels of satisfaction after bowling with strangers than before. So, in short, be a good friend to yourself! Pretend you are your best friend and play! Make up other ideas and explanations for yourself that will let you see the big picture, and that will make you act more productively than stewing in those not-helpful thoughts. Take-away: Pretend you’re your best friend, and talk to yourself kindly, productively, encouragingly – the way you might to your really good friend! Source for acts of kindness study: Lyubomirsky, S., Tkach, C., & Sheldon, K. M. (2004). [Pursuing sustained happiness through random acts of kindness and counting one’s blessings: Tests of two six-week interventions]. Unpublished raw data.